Camping in summer has always enjoyed great popularity. Now caravanning is becoming increasingly popular in winter as well. 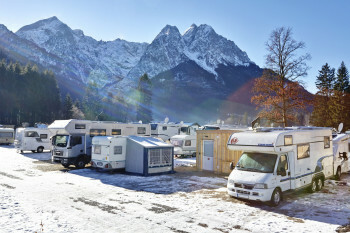 Many campsites have already installed facilities for winter holiday-makers, such as drying rooms for skiing equipment, heated bathrooms, and even proper sauna and spa areas. With good insulation and powerful heating, modern caravans and mobile homes are also fit for cold temperatures. So if you want to spend your next ski trip in a cosy caravan, we show you the best sites for winter camping in the Alps. © Camping Resort Zugspitze A ski bus takes you from Camping Resort Zugspitze to the slopes of Garmisch Classic. At the foot of Germany's highest mountain, you'll find Camping Resort Zugspitze. The camping ground features a ski room and toboggan rental as well as discount on ski rentals in Garmisch-Partenkirchen and a ski shuttle to Alpspitz- and Kreuzeckbahn. The ski bus also takes you to the local mountain for free. If you don't have a caravan, you have the opportunity of sleeping in a cosy mountain hut, or one of the sleeping barrels, which is certainly an extraordinary experience. Its modern sauna and gym area with a view of the Zugspitze is certainly one of the camping resort's highlights. Another panoramic campsite is located in the Allgäu. Right by Lake Forggensee, Camping Brunnen in Schwangau boasts an amazing view of fairytale castle Neuschwanstein. Cross-country skiers in particular will find a nice amount of diverse tracks here on the outskirts of the Ammergau Alps. Afterwards, wind down at "Relax Alm", featuring three saunas, a whirlpool, and a spacious relaxation room. 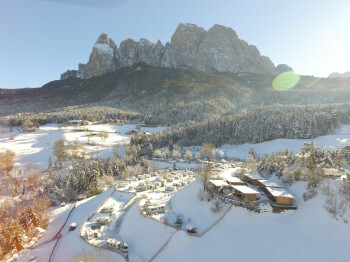 © TIROL.CAMP Leutasch TIROL.CAMP Leutasch is a top destination for cross-country skiers. At TIROL.CAMP Leutasch you have the ski resorts Rosshütte and Gschwandtkopf as well as extensive cross-country trails right at your doorstep. Holiday-makers use the tracks and ski buses for free with the Olympiaregion Seefeld guest card. 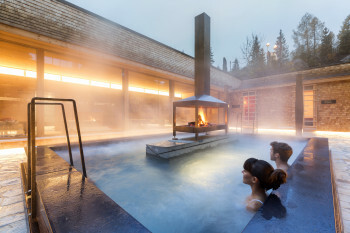 After a successful day on skis, a swimming pool and sauna area invite you to relax. Heated floors in the bathrooms provide a little extra comfort. Camping Ötztal Längenfeld has a lot in store for winter sportsmen. The Ötztal features 60 kilometres (37 miles) of cross-country tracks and 365 kilometres (227 miles) of slopes. A free ski bus takes you to Sölden in only 10 minutes. Furthermore, the campsite boasts luxurious sanitary facilities, an indoor playground for the little campers, and a heated ski room. If the on-site spa is not enough, Aqua Dome is only a two minutes' walk away. At the Ziller valley, Hells Ferienresort can fit almost 200 caravans. After a day on the slopes, the 5*Eco campsite in Fügen invites you to relax at the spacious spa area. The highlight: through large panoramic windows you never lose sight of the beautiful mountain-scape. © Sportcamp Woferlgut Sportcamp Woferlgut features an extensive swimming area. Campingplatz Grubhof is situated within the Berchtesgaden Alps and the Lofer Mountains. As it is directly adjacent to a large network of cross-country and hiking tracks, guests get to choose between diverse winter activities. The family ski resort Almenwelt Lofer is easily accessible by free ski shuttle as well. At the end of an exciting winter day, enjoy the on-site spa with its sauna, steam bath, and massages. In Bruck near Zell am See, Sportcamp Woferlgut makes for a luxury winter holiday. With Schmitten, the family mountain Maiskogel, and the glacier on Kitzsteinhorn, skiers find a diverse range of slopes in close proximity to the site. For a little extra fee, campers get to use the pool area featuring five swimming pools, a tyre chute, and a spa. Located right by Lake Millstätt, Camping Brunner am See features a beautiful space for ice skating. Afterwards, guests can warm up their cold feet at the comfortable sanitary facilities equipped with heated floors. A ski bus takes winter sportsmen from the campsite right to the nearby ski resort Bad Kleinkirchheim. © Seiser Alm Seiser Alm is one of the camping destinations in the UNESCO World Heritage Dolomites. Italy is another great destination to find comfortable winter camping grounds, such as the one at the foot of Europe's largest high alp. Campsite Seiser Alm in Völs am Schlern not only boasts stunning panoramas of the UNESCO World Heritage Dolomites, it is also conveniently close to the ski resorts Seiser Alm and Val Gardena. A shuttle service takes you there in only 3 minutes. Cross-country skiers and winter hikers will also get their money's worth at the sun-kissed plateau. Camping in the Sexten Dolomites is all about recreation. Hence, Caravan Park Sexten invites you to relax at its luxury spa oasis featuring swimming pools and saunas. If you'd rather be more active, make your pick between 100 kilometres (62 miles) of slopes at the ski resort 3 Zinnen, 200 kilometres (124 miles) of cross-country trails at Hochpustertal, and various snowshoe or skiing circuits and winter hikes. © Caravan Park Sexten Caravan Park Sexten proves: camping and spa are a perfect match. 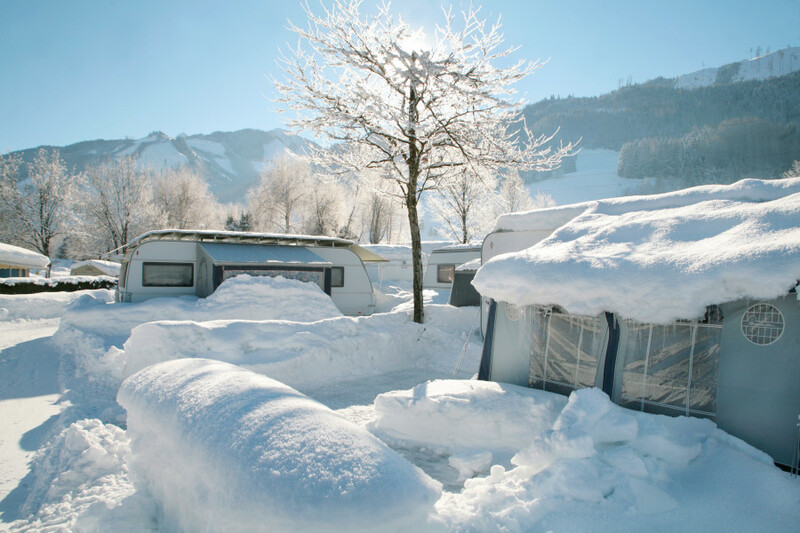 Campingplatz Sägemühle in Prad is your ideal family-friendly winter holiday spot in Vinschgau. The ski resorts Trafoi, Sulden, Watles, and Schöneben-Haideralm are only 15 to 30 minutes away. Trafoi and Sulden are even connected to the site through a free ski bus. If you enjoy tobogganing, you can do that at the practise slope in Prad. End your day relaxing at the panoramic indoor pool.